Everyone's Buzzing About this new Creative Planner! 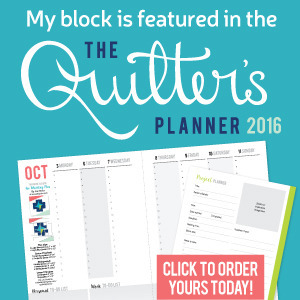 It seems we are in that season, my dear friend Stephanie from Late Night Quilter has also recently launched a really amazing quilting product, the Quilter’s Planner! She’s launched an IndieGoGo project to fund this venture and while she’s already raised almost 6 times her goal; if you’re a quilter this is going to be a must have for 2016 and a great gift for your favorite quilter this holiday season! One thing I’m super excited about is being able to plan my projects and keep my projects organized within a day planner. This is something I’ve always struggled with as a creative person with a full time job. As Stephanie said in her video for the project, I also find myself with multiple notebooks and lists all over the place. I’m also excited to tell you that I’ll be in the planner as a Stephanie is including quilt and block patterns in the book too! My block, String Showcase, from the 2015 New Quilt Block Blog Hop will be in the planner! I’ll be amongst some fabulous other designers (and many other dear friends) like Cheryl Brickey of Meadowmist Designs, Yvonne Fuchs of Quilting Jetgirl, Amy Garro of 13 Spools, Lee Heinrich of Freshly Pieced, Mandy Leins of Mandalei Quilts, Pat Sloan and Kitty Wilkin of Night Quilter! Make sure you place your order through Indiegogo to make sure you get your planner and get ready to get organized for 2016!